MIDI Guitar 2, BETA9 is out! 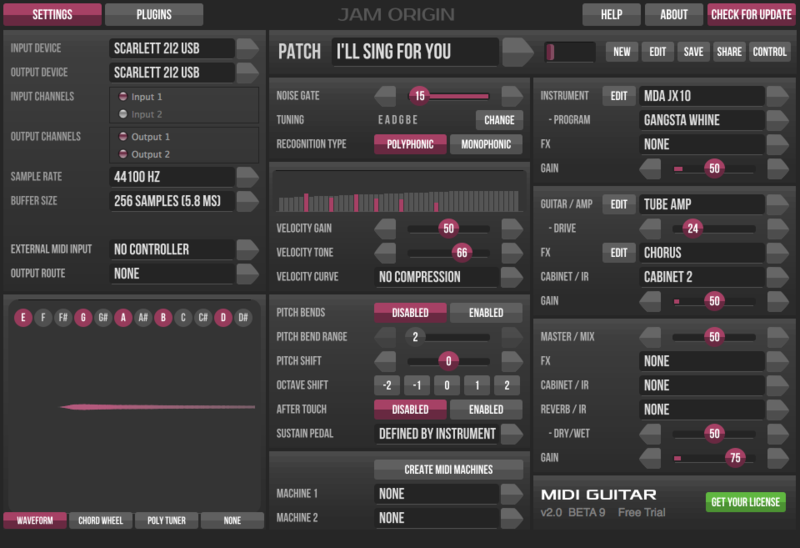 MIDI Guitar 2, BETA 9 is now available to customers. You should get a pop up notification about the download when you run your current version. During the next few weeks we will enter a quick release cycle and publish more updates with a focus on fixing the last bugs and remove the BETA tag. As user feedback confirms that everything is ok, and the load on our customer support cool down, the new features will be available as a free trial to non-customers as well. MIDI Bass and the iOS version are also being updated soon. Please sign up for our newsletter to stay updated with release news. Pitch bends. Ultra low latency and accurate pitch-tracking. New slots for inserting audio effects. 3 effects (Delay, Chorus, Flanger) are built in. Mix/morph between the MIDI instrument audio chain and the guitar audio chain, optionally with a floorboard pedal. New slots for cabinet impulse responses and effects. Sharing patches on any media and load patches by copying to clip holder (ctrl-c on the keyboard).